The ImmersionRC Uno V4.1 receiver can pass the required power, audio, video, and data with a bi-directional data link cable which is through a single Mini-Din connector to the Ground Station. The Uno V4.1 is supplied with a 3 dBi antenna and traditional 3.5mm jack and DC power jacks for compatibility with older systems. (The mini-din connector will be available separately. The ImmersionRC Uno V4.1 includes 1 30cm a/v cable with female RCA plugs and 1 2.1mm barrel connector power lead with bare wires to allow integration across many systems). The Uno V4.1 has a high bandwidth stereo audio channel for telemetry information. The data link allows the Ground Station to know the received signal strength (RSSI) in real time, allowing it to warn the pilot of low-signal conditions this will help keep a GPS-tracked antenna mount pointing in the correct position of the aircraft. This same data link allows the Ground Station to control various aspects of the receiver. When an antenna is mounted directly on to the antenna’s RF output it will eliminates cable loses, however it can cause difficulty gaining access to the controls directly on the receiver, however the Uno’s data link channel selection can be controlled on the ground station. 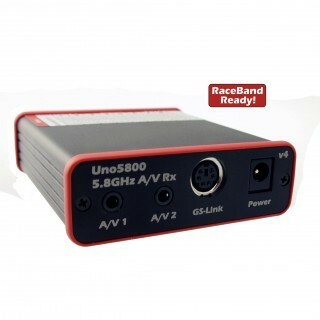 The V4.1 Uno has a triple buffered audio and video output for the best posible video signal. 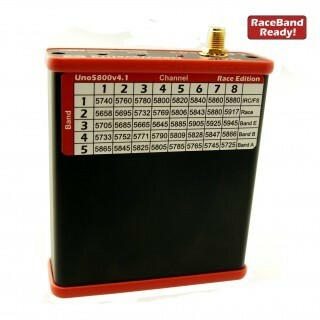 The ImmersionRC Uno V4.1Uno 5800 has a > -90dBm this means that the Uno is very sensitive when paired with an appropriate antenna, it will give you many miles/km of range. If you add an antenna tracker, and a higher gain antenna this range is increased significantly. Like every ImmersionRC product the Uno V4.1 5.8 Ghz receiver has been engineered from an First Person View pilots perspective, it will warn you when the receiver battery runs low, with an automatic, or user-settable low voltage threshold. 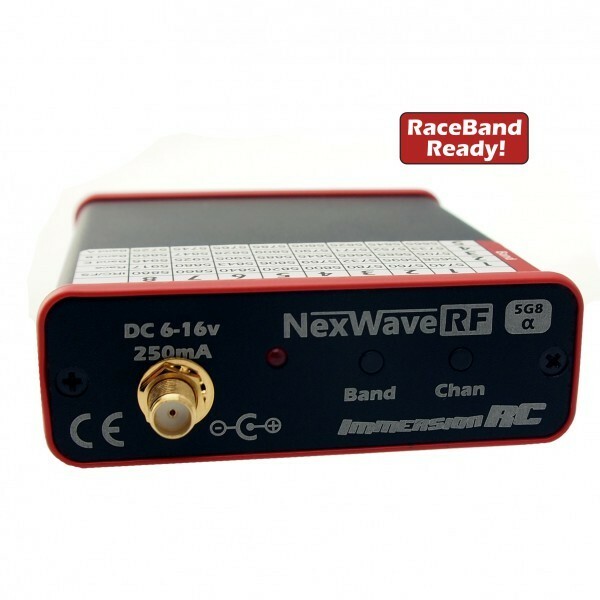 The increased performance of the Nexwave modules, combined with the ImmersionRC SpiroNet 5.8 GHz Circular Polarized Antennas and ImmersionRC SpiroNet 5.8 GHz Patch Antenna,will make FPV using ImmersionRC 5.8 GHz 25 mW Transmitter systems much more viable. The ImmersionRC Uno V4.1 receiver is compatible with the existing Fat Shark and ImmersionRC 5.8GHz equipment. The Uno has extensive filtering of UHF and 2.4 GHz emissions in close proximity to the receiver (important for goggle users). The Uno V4.1 will work on standard frequencies: 5740, 5760, 5780, 5800, 5820, 5840, 5860MHz and a voltage of 6-16 volts, the Uno V4.1 can be powered from a 3 or 4s lipo battery to keep the system easy to transport. Excellent product at an unbeatable price with super fast delivery-very pleased! Will hope to deal with you again.